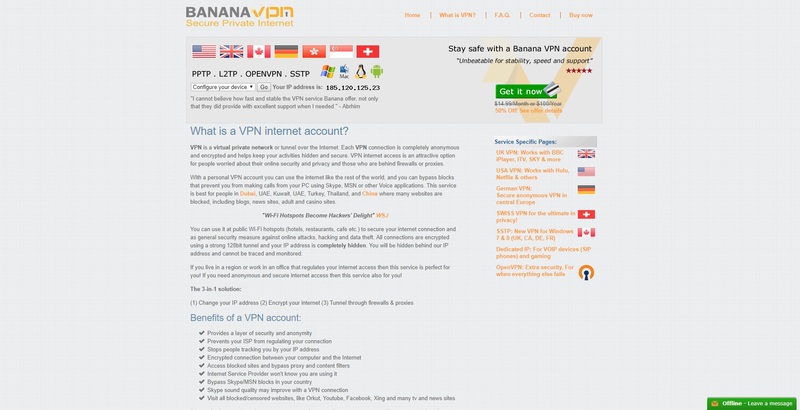 Banana VPN offers internet users the perfect VPN to protect themselves and access restricted or blocked websites. The VPN provider gives access to servers placed in eight different countries providing secure internet browsing via virtual channels using OpenVPN, 12tp and PPTP protocol technologies. With Banana VPN working from anywhere in the world to provide unfiltered connections and top security it earned favourable mentions in PC World, Znet and PCM magazines. By subscribing with Banana VPN individuals worldwide enjoy an extra layer of top security that offers anonymity during internet surfing while having the ability to connect to servers and choose an IP address in several countries including the United Kingdom and United States to name only two. The VPN enables the use of geo-restricted websites such as Facebook, Skype, Yahoo, and Google Talk in areas such as the Middle East, Guyana, Kuwait, Brazil, Turkey and Singapore as well as other services in countries around the globe. Banana VPN offers reliable VPN services across a variety of platforms and operating systems, including Windows, Android, MacOS, Linux and iOS. With the use of Banana VPN access is granted to a tunnel or Virtual private network to the internet, each connection is encrypted and anonymous and keeps all activities secure and hidden. It is a brilliant option for all individuals that require privacy and online security. With a personal Banana VPN account, you are able to use the internet freely as it offers the ability to bypass restrictions and has been voted best for users based in China, Thailand, the UAE and Dubai. It is no secret that wi-fi hotspots are now known as hackers delights since free wi-fi offered at restaurants, hotels and coffee shops are under the most targeted by online hackers and identity thieves. With the use of the VPN all connection, including wi-fi hotspots are encrypted via 128-bit encryption, and your IP address is replaced with a VPN server IP address making it untraceable as well as un-trackable. It is also the most favoured VPN for anyone who resides, works or lives in an area that is internet access regulated. Banana VPN is a three-in-one solution that changes subscribers IP address, encrypt all their internet activities as it is tunnelled through proxies and protected via firewalls. Complete wi-fi hotspot protection and all data on your mobile device or computer remain fully encrypted. Banana VPN offers uncensored internet in many countries including Asia and the Middle East, which include for example blockage by Etisalat proxy in Qatar, Qtel or Dubai or even behind the firewall of China. New subscribers can look forward to paying only half-price for the first month by using the half-price discount coupon. What is quite different about Banana VPN is that an order form needs to be completed once a subscription plan is selected. The order form requires company names as well as GST/Vat numbers, and for individuals, it requires first and last names, email address, home address, and contact details. In the additional information block, newbies need to give a purpose for the VPN use, and lastly, new users need to complete the payment information section. Payment options offered by Banana VPN: Visa, JCB, Maestro, American Express, MasterCard and Visa. All financial transaction and accounts are handled by BlueSnap, which is a reseller for services offered by Melba Limited, although all personal information and sensitive banking details are secured via MacAfee Secure. The technical support guide offered by Banana VPN provides tutorials and answers all question regarding installations of new services, connection difficulties, and several other queries. Check the box to add a connection to your desktop and select Finish. It is important for individuals in Guyana, Morocco, Belize and Oman to know that both GRE and PPTP is blocked in these areas and therefore Banana VPN recommends the use of IPSec or L2TP VPN offered in a section that is directed at such difficulties. Praised by thousands of happy customers for speed, reliability and great performance, Banana VPN also includes acceptable VPN downloading and uploading speeds. During multiple tests, the average download speed is around 50Mbps while the upload is 1.5 Mbps. What impresses most about Banana VPN is how easy it is to navigate the website, find country-specific tutorials and how easy it is to follow the instructions. The service provider does not permit any Emule, Torrents or P2P, while most individuals are happy with access to services such as SKY, ITV, BBC iPlayer, Netflix, Hulu and other geo-restricted services. Even though no trial period is available, Banana VPN offers a 7-day money-back guarantee, and first-time subscribers can use the pay-for-half the month coupon or subscribers of 6 months to 12 months get to claim a once off 50% on the entire subscription period. With protocols supported such’s as SSTP, OpenVPN, PPTP, L2TP across all devices including Windows, Linus, Android, MacOS, iOS and routers, Banana VPN is a great option for anyone who requires anonymity, security while on the web or while using wi-fi hotspots, as well as unblocking all restricted websites.